There’s no doubt that women 45 plus are living OUT LOUD these days. NextTribe is proud to give the stage to accomplished female writers, photographers, artists, musicians and activists so that they can be SEEN and HEARD. NextTribe Out Loud is a series of live events where we explore how women in our demographic are reshaping our culture and expressing their rightful power. 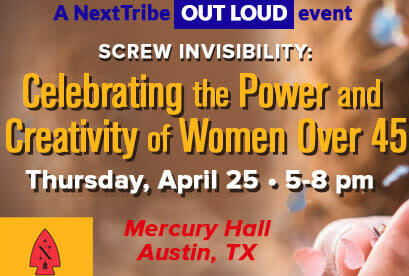 Read about last year's event in Austin here or our Out Loud event in NYC here. Every attendee will recieve a piece of jewelry from sponsor Kendra Scott and a CD set from speaker Sara Hickman. A PORTION OF EVERY TICKET SOLD WILL BE DONATED TO SURVIVE2THRIVE--A NON-PROFIT THAT HELPS DOMESTIC VIOLENCE SURVIVORS, FOUNDED BY OUR SPEAKER COURTNEY SANTANA.